A midweek fixture to end the season. Unusual. A home game at the Rec after a long long winter. Unusual. Gales gusting in the 40mph territory. Unusual. And Langton Green chasing the KYL title. Unprecedented. The Jets started uphill against the wind, and had the first chance as Todd turned Jack's long throw just wide....conditions were difficult but Jack thumped a screamer into the top corner on 10 minutes, and then Ben W lobbed just wide. When Matt's cross-shot leaked over the line as the keeper couldnt hold it everything seemed set fair, but a lapse in concentration allowed Anton to slip in and pull a goal back. 2-1 uphill was a good place to be, but closer than the chances merited. The pattern of the second half was pressure in one half of the pitch, but chances going unfinished. Jack and Ben both reached the byline to square for Todd, but the chances werent converted. Scott put one over the bar from close range, Jack side footed over the bar from 10 yards out, Ben lobbed wide, then hit the keeper and the 'safety valve' goal just would not come. And, with an air of inevitability, Rusthall got a free kick with a minute to go, and it was put in the top corner from 30 yards out. At the final whistle one side was thrilled with a draw, the other was gutted not to have won, which told its own story. Dont tell anyone from Langton Green that football is a funny game. Tonight it was a heartbreaking one. Sport does that; it is why we watch, because we never know what may occur. Nor would it be a good time to say it is character building, but that is probably the case. The first of two local derbies to end the league campaign, and still everything to fight for. The Jets had a powerful line up, Toby won the toss and pointed the team downhill and downbreeze. Everyone knew this was a 'must win' game and there was a clear game plan, whilst still plenty of emphasis on remaining calm and controlled. The early minutes saw Jet possession established, but clearly the dry bouncy pitch was going to make life difficult in terms of the final ball. Jack's throws were a potent weapon, and were treated like a corner set piece....but the goal wouldnt come. Mid-way through the half Cam took matters into his own hands, playing his role as marauding full back to perfection and bursting through to grab the lead. This released the pressure - Todd added a second from close range, Scott nodded home Matt's corner, and Will and Ben W each helped themselves to a finish from a cross from the left. Second half, uphill, was harder but the football was neater, George connecting things nicely in midfield. Nathan enjoyed a more advanced role, and Jack continually made the by-line and set things up unselfishly. Todd helped himself to 3 tap ins, and Ben W finished a breakaway in style. With a few minutes to go Toby was sent up front and almost scored his first goal in....forever. All the while Scott and Harry had the defence neatly organised, and Sam added some poise too. Less than 3 days on from the pain of a lost cup final and the Jets had to raise themselves for an away game to the form team of the division, Welling, without Jack who was on Comet duty. The game started evenly, and Matthew's goalbound shot was blocked at close range; everything seemed calm. However some defensive looseness cost a goal, and then another, as Welling looked threatening each time they counter attacked, whilst the Jets showed the pain and frustration of feeling the season slip away. 3-0 quickly followed from (yet another) easy header from a corner. The general play felt even, but the goals were pouring in, and self belief was gone. It is safe to say half time marked the low point of the season. The boys had endured criticism from the touchline and were reeling, starting to argue, playing the blame game and a rudderless ship. Neil went to visit the supporters to remind of the need for support and positive encourgement, whilst Chris tried to patch the open wounds. The boys agreed the primary need was to back each other and pull together. Regardless of the result there was a need for unity and commitment. Then another break, and a penalty adjudged.....cruel, 5-2. Game killer. The boys kept going and George went close, as did Ben....there was still time for another Welling goal - their finishing was lethal all day. A Thursday night, under floodlights, the biggest crowd the boys had ever played in front of, a proper 'occasion'. And with that the pressure to perform, the hope of glory, the risk of heartbreak. Out of the blocks the boys were rampant. Inside 2 minutes Ben W went through and slotted home, 1-0. Soon after Jack burst into the box and slid the ball past the keeper....and hit the post....the ball seemed to spend an age on the line before being scrambled away. Then Jack again, this time saved by the keeper, and the rebound knocked inches wide. Whyteleafe were like boxers hanging on, trying to avoid the knockout blow for long enough for their heads to clear. And to their credit they forced their way back into the game. The Jets had a free kick and sent everyone forward but it was blocked and cleared into the path of a lightning quick striker. He went straight down the pitch, 1-1, after 13 minutes and a whole new ball game. Now the Jets had to withstand pressure, and survived a scare as Angus scrambled away a ball that ought to have been tapped in from close range, and a header shaved the top of the bar. All the while Jack and Ben were scaring defenders with their pace. The huge pitch was making it very hard for midfielders to get far enough forward to support and be a goal threat themselves, though Cam, Matt,George, Will and Nathan were passing short and neatly in midfield areas, and working very hard. At half time it was clear the game could go either way. The Jets won a succession of corners but the pitch was so wide it was hard to turn them into a goal threat. Scott and Harry were immense at he back, against dangerous strikers. Toby somehow managed to sit on a close range shot and keep it from crossing the line, and time ticked by, with extra time beckoning. Then the key moments....Jack sent Matt through, one on one. The keeper was committed, outside of his box, and Matt got a touch past him, but was taken out before he could shoot at the unguarded net. A free kick was small compensation for how big of a chance it was, and the shot was too low and blocked. Then, with 5 minutes to go a Whyteleafe free kick, on the right side of the box. It was curled in, hit the post, and the Jets froze, and the ball was poked home. The achilles heel of set play vulnerability had hurt them again. There was still time for one last great chance to equalise but Ben W's shot picked out the keeper, and the whistle came, crushing dreams. It really hurt. Knowing that they could have won, probably even should have won, may in time be viewed as consolation, and be a reason for pride, but on this night it just made it worse. The boys had to watch the trophy handed to their opponents, to grin and bear it, and to their credit they were dignified and sporting. The supporters had been fantastic, and it felt terrible to disappoint them. But that's sport and the team have chosen to compete at the highest level, and with that comes the potential for lows as well as highs. Sunday brings a new mountain to climb. Four league games to go, and every one feeling like a cup final. Ebbsfleet arrived at the 3g, to face a team determined to battle every minute of every game remaining. In the early skirmishes it was clear the referee was in no mood to put up with foul play or back-chat, which left the visitors on the back foot, and most of the play in the Ebbsfleet third of the pitch. Jack played centrally and Ben R played wider left today, and both adapted to great effect. Playing further up the pitch allowed Ben to be a real goal threat, and he burst through and smashed a shot into the far corner, 1-0 a great goal. Thereafter it was one way traffic and Jack came close to doubling the lead. Will was having an excellent game down the right, and it was that flank that the next goal came, as Jack reached the by-line and rolled the ball back for Cam to pass home, a beautiful goal. Ebbsfleet seemed constantly at odds with things, and George was flattened, and needed to come off. From the restart Jack cut onto his left foot and found the bottom corner from distance, and soon after Todd made it 4-0 from close range, a huge relief for him after so long injured and waiting to get back in the groove.Unfortunately an injury time free kick was conceded and brilliantly finished which knocked the momentum a shade, but overall it was a great first half. In the face of a confrontational atmosphere it was important not to let their opponents find reason for hope, and the Jets mixed crisp passing with the occasional moment when Scott stepped in to kill an attack stone dead. He and Harry continue to complement each other to great effect. Toby needed to be confident coming off his line to deal with through balls, but had no major saves to make. There were chances to extend the lead. Jack set Todd up for one he would convert more often than not, but the important thing was that Todd was in there and battling; his legs are returning....Will crashed a left foot shot that was brilliantly saved, and he also tackled with a determination that stood out. Nathan spent more time in their box than his own, and overall 4-1 was an understatement. Sadly the referee was enduring a torrent of criticism just for doing his job well, and sideline comments were marring the atmosphere. Despite the distractions the Jets knew to stay focused and saw the game home, cheered on by encouraging and loyal supporters. A fine performance, which grew in value as other results came in. 3 league games to go, and a cup final up next. The boys continue to meet and exceed expectations. Out of nowhere a sunny day, and instead of mud it was a bobbly pitch to contend with as the Jets travelled to Cuxton. For the first time this season Toby was absent, as was Nathan, so Harry B took the gloves. Entreated not to let Cuxton get a foothold in the game, or the chance to get forward from set pieces, the Jets conceded an early free kick, lined up poorly, and were second to the rebound after Harry had saved bravely. 0-1. Exactly not what was needed. The Jets had failed to score on a tricky pitch at Aylesford and at KFU so this had the makings of a repeating banana skin. That concern was compounding when Ben W went close, Jack lobbed the keeper and landed the ball on the roof of the net, and Scott converted Matt's free kick only to see the goal disallowed. Playing four at the back given the pressure the boys were exerting seemed one too many so they reshuffled. A goal followed almost immediately. Possibly the most scuffed corner of the season found its way to Jack's feet rather than his head and he banged the ball home from close range. An ugly goal, but very needed. Not long after and Ben W chased a through ball and lobbed it home expertly to calm things down. The football started to flow, and Cam was pushing up from the back when he was brought down. Matthew stepped up to make it 3-1, and came inches from heading home another from Angus' fine cross. After that, in the only other attack of the half Cuxton looped a ball into the area that a backpedalling Harry just managed to touch onto the bar, and Will's toe was just long enough to poke the ball to safety. This was a reminder that a lack of vigilance could still cost the boys dear. Half time focused on that and the need to see the game home. The second half was one way traffic, but the conditions made clinical finishing hard, and underlined how important the first half goals had been. The biggest danger was that in chasing a 4th goal the Jets would let Cuxton back into the game. With 3 and sometimes only 2 at the back it got scary a couple of times; perhaps more remarkable was that with so much attacking going on the Jets couldnt score. Ben W was a constant thorn, Taig and Todd both had good chances, and the Cuxton keeper managed to scramble some midfield shots round his post. Back to earth, as the Jets lost their momentum on a return trip to the scene of their semi final cup win. They spent much of the first half pinned in their half as conditions contributed to a game of high energy pinball, but with the slope and the wind against them whilst the scores were level it wasnt the end of the world. However with half time approaching it turned ugly as a succession of left sided free kicks and corners took their toll. Not for the first time this year a corner wasnt cleared, and the second ball wasnt chased hard enough, and the consequence was a rerun of games past....a soft goal. This wasnt a day to be chasing a game - bobbly pitch, strong wind, and the Jets tried to fix things too quickly, abandoning short passes and possession so the rhythym was disrupted. Missing Jack the Jets also missed a familiar shape and pattern of play. Even so as the clock ticked on there were an increasing number of chances. Todd had a shot blocked, William looped one just wide, then Cam was denied by a last ditch tackle. Pressing for the equaliser breakaways were a threat, and only a great recovery run by Will kept the game alive. Then in the final minute Cam was clattered to the ground in the box and it looked like there would be a chance to equalise. The ref waved play on; no penalty. KFU's coaches were generous enough to concede they had dodged a bullet, and the final whistle came soon after. There could be no hiding from the importance of this game - the top two teams in the league, not to mention the cup finalists next month - everything to play for. After last week's draw the Jets probably needed a win even more than Whyteleafe, so it was a cause for thanks that today was the first time in the whole season that every player was available for selection (even though that brings its own headaches). On a cold and blustery day the Jets kicked off with the breeze behind them. It was a tense opening quarter, with both sides making most inroads down the left, but neither creating a clear chance. Jack's aggressive running led to a lot of throw ins that were sent in deep and caused anxiety, but nothing dropped to hopeful feet. Scott and Harry continued to present an unpassable back line, whilst the defence and midfield worked hard not to concede set pieces in dangerous areas. Will was coming in from the right and playing well, and George and Ben R denied anyone time in the middle of the pitch. The best chances came when Matt burst down the middle and set up Jack, who went a little too wide before shooting, allowing the Whyteleafe keeper to get his angles right and make the save, and then from a corner that Harry headed just over. Todd came on and was unlucky to pick up a knock almost immediately, and the half came to an end, nil nil. At half time Whyteleafe were probably satisifed to have endured the harder conditions, whilst the Jets were perhaps wondering if, as with the Maiidstone game, they would rue having first half pressure but no goals scored. The team was re-jigged, bringing Cam into the midfield and pushing Matt wider right, and the boys were encouraged to 'go for it', no tomorrows. The weather got wetter, colder, and windier. Whilst this might be a hindrance it possibly worked in the Jets favour; the boys knew there was no point lumping the ball into the wind and watching it spin back, and committed themselves to passing their way forward, low and carefully. Nathan was having his best all-round game of the season, and was linking well with Jack, and Cameron led by example with patient passing to set play up. Most of the play was in the Whyteleafe half, until Harry ducked under a through ball thinking it would reach Toby, and then realised it wasnt going to. The striker closed in on goal and Harry faced a red card if he put a foot wrong. His timing was magnificent however, and the king of the last ditch tackle had averted a crisis. Meantime, like a predatory shark waiting to strike, Ben W had been lurking up front. He had already caused problems by closing defenders down and nearly dispossesing them in dangerous areas. This time as Whteleafe pushed forward Cameron won the ball and slid it behind the centre back for Ben to chase. He went directly for goal, presenting the Whyteleafe defender with the same red card dilemma Harry had just faced at the other end. Keeping his body between the ball and the chasing player Ben closed in on goal and finished calmly; a fantastic goal. Amidst the celebrations the boys were reminded to keep going forward. In the away match Whyteleafe had proved very dangerous against a team trying to sit on a lead. A second goal looked more likely than an equaliser on several occasions, but the ball wouldnt drop, or the keeper did well, as he did twice from Jack and Cam. Scott headed a corner just wide, and then finally the ball was in the net only to be given offside, the officials perhaps not noticing the defender who was behind the goalkeeper. No matter, it was all positive intent. The only scare came when Toby mis-kicked a clearance and was forced to a great diving save to redeem the situation. Overall he had his second fine game of the season versus tough opponents, and was helped by Sam and Nathan being comfortable to receive the ball from him under pressure. In the last 5 minutes it was tense as throws and crosses were hurled in, but generally dealt with well. As the weather worsened the team with the lead had the reason to chase, tackle, and battle just that little bit harder. The final whistle was met with a whoop from players and supporters alike. Having been beaten by this team 5-2 twice last season it was progress to nick a win in October, but the satisfaction of this game was that this time the win was well deserved. All 14 boys played their part, delivering all the effort and application called for before the game. The league campaign is back on track. The first week of half term saw the Jets missing 5 players: no George, no Cam, neither of the Bens, nor Declan, so they were vulnerable. A heavy pitch would make for tired legs, and as (bad) luck would have it Taig was knocked out of the game with a head injury after just 25 minutes. With tough playing conditions and a line up that had an unfamiliar look to it it would be hard work all the way. Neither side had many chances and it became a game of territory. Scott and Harry had excellent games again, and Toby looked sharp behind them. The best chances were from through balls to Todd from Matt and Jack, who worked tirelessly in the middle,but these were far from ideal conditions for someone coming back after 3 months out. There were no changes at half time; with no subs on the bench the tired legs had to keep going, and the effort in the second half could not be faulted. A couple of times Todd almost broke clear but was overhauled, and there was one moment of pinball on the edge of the Aylesford six yard box where the ball just wouldnt drop to a Jet in the right place. To give Aylesford their due they forced Toby into an acrobatic dive, and Harry had to make a last ditch tackle, but had either side scored a late winner it would have been rough on the other. And....Aylesford have been unfailingly sporting this season across three encounters, and worthy of respect. The Jets wont know if it was a point gained or two dropped until the end of the season. There is a pack of teams chasing them (who all have to play each other) and next week's game will be critical. At least it should be a full squad and a dry pitch.....no excuses. Back on the 3g in the league on a cool sunny day. And for the first time in 3 months Todd was back too. The Jets dominated possession but were imprecise with their passes in the final third until Jack got to the by-line and Ben W finished from the pull back. That ought to have settled things down but after giving away unnecessary free kicks and then not clearing them properly a recycled ball was looped into the six yard box and Toby got in a tangle he was left to rue. Fortunately he was bailed out quickly when Will stooped bravely and won a free kick in the D. George knew he needed to execute and curled the ball perfectly, 2-1. Scott nearly added another but all in all it was a messy half, but a lead. Tough words at half time, but not for the defence which was solid and gave up nothing. The midfield passing was still not as precise as it might have been but another free kick edged the Jets into comfortable territory, this time from distance, as Matthew expertly found the top corner. Thereafter the chances came and went, as both Todd and Harry had headed chances they might have scored another day. Angus had a storming second half up the right, and Nathan did good work down the left. Jack got the goal his performance deserved and it ended 4-1 which reflected the dominance of possession. Since their season opener in September Langton Green and Kent Football United have gone their separate but successful ways. KFU have reached two cup semi finals, and gone on a twelve game winning streak, whilst Langton Green find themselves top of the KYL. THere was no way to pretend this wouldnt be a big match. Still missing Todd, and with Cam away on Brighton duty, the Jets lined up in a new formation, albeit with a plan B up their sleeves. After two minutes plan B was forgotten, as Ben R burst into the box, and took the bold route, cutting inside onto his weaker foot to drive firmly home. A huge start, massive in terms of settling the boys down. KFU were playing up the hill which made it hard for them to gain a foothold; not knowing what a par score was with the benefit of the slope the Jets were torn between pressing for more or protecting what they had. Harry and Scott were outstanding in dealng with attacks early. Just before half time Jack headed onto the roof of the net, then burst through only to be dragged down. We've seen 'em given, but not today, and the half ended with the Jets giving up territory as KFU pushed on, but not giving any clear shooting chances. The half time talk was a 'more of the same' version. The big question was whether George, Matt and Ben, could continue to compete with such vigour, and whether Jack, Will and Gus could keep making ground down the flanks. They could. Early in the second half Jack made the by-line and pulled the ball back - the only half time moan had been about crosses too close to the (very good) KFU keeper - this cross found Ben W, who found the top corner, a cracking goal. Not long after Jack intercepted a poor clearance, 'Shoot!' was the cry from the passionate supporters, and he lifted the ball over the stranded keeper from distance. A difficult skill executed at the first time of asking in a big game; a sign of a quality player. Three nil nearly became four when Gus had a fine volley brilliantly saved. KFU were forced to be increasingly direct, which played into the hands of the defenders. Credit also the midfield for never allowing KFU time to line up a penetrating pass. Late on Ben W took a rest after covering a ton of ground up front, and Taig came on and took his chance to seal the game. 4-0 makes it look easier than it was, but it certainly was one of the Jets' best performances of the year. That will live in the memory, but so too will the sportsmanship shown by KFU who lined up to applaud their opponents off the pitch - classy. A special day, rewarded with a cup final to look forward to in late March. Now it is back to the business of fighting for the league. A top of the table clash at the 3g as Maidstone came seeking to avenge a 3-1 loss before Christmas. The Jets welcomed Ben back after 4 weeks out, but had to adjust to the loss of Cam and were still missing Todd. Maidstone started brightly without turning possession into chances, whereas the Jets took time to establish themselves. However in the last 15 minutes of the half the tide seemed to have turned as the Jets forced the Maidstone goalkeeper into 3 outstanding saves, and saw a header inches past his post. Optimism was justified at half time, but there was the knowledge that one slip could be fatal. Chances were hard to come by, unlike tackles, of which there were plenty. Harry and Scott were proving an excellent defensive partnership. But with 15 minutes to go a soft corner was conceded, and from the corner the Maidstone number 9 nodded home from close range; a really frustrating goal to concede. Thereafter the Jets fought to get a foothold but Maidstone held firm, and near the end a Maidstone free kick floated all the way in at the far post; one might say a fluke except it was an exacxt replica of the goal scored in the first match. So, a 2-0 loss in a game the Jets could have led, and could have won. That's football, and the challenge is to learn from mistakes and bounce back. Next week csnt come too soon. On a cool, sunny but windy, day the Jets welcomed Chatham to the 3g. They kicked off down the hill and down the breeze, and the conditions helped them to play the early exchanges in the Chatham half. Twice they might have taken a lead from one of Matthew's well delivered corners from the left, but instead the goal came after excellent interplay down the right, before Jack was first at the near post to convert George's cross. More might have been expected to follow, but the tackles were not being won, and when Chatham broke their striker beat 3 defenders to the first ball, and then converted the rebound when Toby could only parry the initial shot. Being level downwind, and not really being at the races was a cause for concern. Thankfully for the Jets George calmed things with a perfect free kick after Jack was fouled on the edge of the box, but the half time talk was more about what was going to have to change than about what had gone well.Soon after the restart Declan came close to increasing the lead, and then Matt did so, arriving late at the far post to convert after Ben W's good work. However the breathing room was taken away almost immediately from a 'worldy' Chatham shot into the top corner from long range....it wasnt enough to keep the opposition out of the box, shooting range had to be protected too. Where it might have gone wrong, instead the Jets found their game. George and Scott began to assert themselves and find outlets with their passes. The attacking midfielders stopped looking for long balls and started to drop into space to receive the ball, and the interchanges were good to watch. Will and Ben linked often, and Jack's aggressive running continually caused chaos. This was all done on a firm platform at the back, as Cam, Harry and Angus kept putting their heads on the long clearances and their feet on the shorter ones. The 4th goal was reward for George being willing to shoot from distance with either foot, his goalbound shot being deflected beyond the keeper's outstretched arm. The Jets said goodbye to a thrilling 2014 by advancing to the semi-final of the Kent Youth Cup, with a powerful performance against Aylesford. Ben R had not recovered from the injury he picked up at Ebbsfleet, and Todd remains sidelined for a while yet, so the pack was shuffled again, (and rotated many times through the afternoon). The wind exacerbated the slope at TWBG and the Jets played with the conditions favouring them, knowing it was important to take full advantage. Scott hit the cross-bar early on from Matt's corner from the right, and Jack whistled a shot wide as the pressure built. Then a corner from the left was floated onto Jack's head, and he nodded powerfully home. Not long after the lead was doubled when Ben slid Jack through. The two reversed roles for a near miss, before Ben got the goal his first half display had deserved. 3 nil at half time and a solid performance, cheered on by a large crowd (who may have been influenced by the mulled wine at least as much as the football). It was important not to give Aylesford any reason for hope in the second half. This involved retaining possession against the wind, and the football played was arguably better in consequence. The back line was solid - Sam was quietly solid - too quietly perhaps. Matt and Jack linked down the left, Jack made the by-line and pulled the ball back for Matt to pass home. If things felt comfortable there was always time for a wake up call, as a needlessly conceded corner was half cleared, and excellently despatched over Toby into the top corner, 4-1. If there was going to be a wobble this would be the moment, but Scott sent Ben clear through and he finished calmly. The game was effectively over but there was still time to see Harry N and Taig both put in midfield shift, and Will play up front. Cam decided to try and score goal of the season, dribbling from the centre circle all the way to the 6 yard box....his shot was saved, only for Will to leap in with a headed follow up. Will looked as happy as Cam looked heartbroken! At the final whistle both teams shared the food and drink. The game was played in great spirit, and excellently officiated. (Or maybe the great spirit was the mulled wine again?). A great day, and a great year.....can't wait for 2015. The last league game of 2014 presented the Jets with the chance of being top of the table for Christmas, but it wouldn't be handed to them easily. Ebbsfleet had only lost once in the league themselves. And, after 5 weeks in a row on 3G it was a return to grass, with no little mud as well, not to mention a strong wind. Toby won the toss and the Jets elected to take the best of the elements in the first half. Whilst not being pretty, it was mainly a game being played in the Ebbsfleet half. A sign of the extent that the Jets were pressing was that it was left back Nathan who broke the deadlock, running clear down the left, and homing in on the target; finally his first goal (at the right end) after 2 years or near misses. Not long afterwards Jack got through and was brought down, and Matt calmly made it 2-0 from the penalty spot. More chances came and went, whilst at the other end the centre backs Cam and Harry were solid, and Toby was cleaning up aggressively behind them. Set pieces aside, it was largely under control, but only half a job done as the teams switched ends. The Jets played a lone striker in the second half, electing to be strong in the midfield. George, Scott and BenR did the hard work in the middle, whilst Matt added a wide threat - Will came on and linked nicely - Ben W linked the midfield to the front line with pace and intelligent running. The third goal came from hard work down the left, and the defender had little chance to avoid putting George's cross into his own net. In tough conditions this was a formidable lead, and with hard work and determination it would be hard for Ebbsfleet to come back. The boys put the work in. Jack was injured and out of the game after coming inches from a fourth. BenW saw his header cleared off the line from the resultant corner, then it was Ben R's turn to retire hurt. Thet Jets were all out of reserves but would not give up their clean sheet. They endured the physical pressure (and the verbal!) and the rewards were theirs at the end. This wasnt a beautiful performance, but other virtues were on display from start to finish, and the supporters played no small part themselves. And so the Jets have their own Christmas no.1 - A spot at the top of the Kent Youth League, not a gift, but a place well earned. The Jets seem to save their worst for Welling; having lost to them in the league they managed to get knocked out the KCC on cold wet morning. The day started with the news that as well as the still injured Todd they would be missing HarryB and BenR as well, as school bugs do the rounds. The team reshuffled, but despite that there seemed no good reason why the boys started so sleepily, and it needed a one on one save from Toby to keep them in the game. Both sides did most of their threatening from corners, as Welling kept coming close. Unfortunately everyone stood and watched a ball that needed clearing and it was 1-0 mid-way through the first half. Then Jack headed just wide, and in a goalmouth scramble no-one had the poacher's instinct to put a way a loose ball in the Welling 6 yard box, before BenW came close on the stroke of half time. Changes were needed. Scott moved up to bolster the midfield, Taig came on on the right, and an equaliser was pursued. It just wouldnt come, as a succession of corners were scrambled away. Both posts were hit, and the ball wouldnt drop in the right places. Nathan kept the game at 1-0 with a great header off the line for a Welling corner. The game ended abruptly; no onjury time despite numerous stoppages in the second half. Frustrating, disappointing, a big let down. Football. The key will be to learn the lessons. It was a top of the table battle today against high scoring Maidstone, with no room for anything but everyone to be on their game. Todd remained sidelined, and Scott was also away, so the 12 available Jets were going to have to work hard on a spacious 3G. They dressed up in Christmas hats and tinsel for the pre-game photos with Chris worrying at the symbolism of the decision to dress Toby the keeper as Santa Claus. These worries proved unfounded as the boys put on their best performance of the season, dominating possession, winning the tackles, and using the ball well. The only thing missing was a first goal as chances came and went, the worry always being that this would come back to haunt. Maidstone were restricted to trying to attack on the counter, and with Cam and Harry winning the half-way line balls Toby wasnt trouibled. In the end the goal that came was scrappy, as George's long shot was spilled, and crept over the line as Jack followed in.The lead was almost doubled as Ben W hit the post soon after, George had another shot well saved, Matt curled in a cross that shaved the post, and assorted corners caused mayhem. Everyone was buzzing. The full backs took opposite approaches; Nathan spent his time in Maidstone's penalty area, while Angus settled for despatching anything that even threatened to come down his wing. Half time team talks look easy when 'more of the same' is the aspiration. The boys took it up a notch scoring within a minute of the restart as Ben and Jack linked beautifully, for Jack to make it 2-0. The keeper made a great save from Ben W to keep the game close, and still the play was one way. Then Jack completed an excellent hat-trick, finishing off great link play from Sam to George, whose cross set the table. All the while the midfield contest was still being won by the outstanding work done by Ben R, Matt and George. At least two of them seemed to be arriving together for every tackle. Harry will still be wondering how he failed to make it four when his header came back out off the inside of the post, though it seemed not to matter until a Maidstone free kick curled across the goal and into the far corner, 3-1. With 5 minutes left there was the potential to jangle some nerves, but the boys saw it home. The quality of play, matched to total effort made this compelling. Everyone could say they had delivered in a big game, against a strong side with a major goal-threat. Defence, midfield, and strikers all did their bit. Happy coaches, happy spectators, and very happy boys. Grim weather over the weekend, so it was a relief and privilege to be playing on the 3G in a local derby. The surface was good but cold wet conditions still made football a challenge. Territorially the Jets had a decent first half, but failed to create clear enough chances to set the game up. Jack did the hard work to get through, but slid wide, and loose balls in the penalty area kept evading Jets' attackers. At the other end Toby didnt have to face a shot, but some slippy back passes did generate a little excitement on the sidelines. Finally one of Matt's corners caused panic in the 6 yard box, Ben W did well to pull the ball back, and Cam bundled it home. It was a deserved led, but hard gained. The half time talk was of the need to concentrate and see the game home, recognising it wasnt a day for fantasy football. The defence delivered on that by not conceding even a goal kick in the second half, never mind a shot. However, the scoreline remained tight as Tunbridge Wells sat deep, dug in, and battled commendably hard. It took a special effort to double the lead - TW were pressing a little further forward when the ball was intercepted, knocked forward by Ben, and Jack from the left delivered a neat cross to.....Cam, who had run half the length of the pitch from central defence to control and strike home, an outstanding effort, capping a fine all round performance by him. Thereafter the Jets dominated without quite managing to reap the rewards of their advantage. Matthew hit the bar from distance, George and Scott came close, and William, having his best game of the season, delivered some excellent crosses that on another day would have been converted. At the final whistle everyone realised just how cold and wet they were. Job done it was time for the party...most of the boys were no wetter in the swimming pool than they had been all afternoon....but it was easier for Pam to serve the (excellent) food and drink inside than it had been to cater in a monsoon! Bad traffic, and a late kick off, on a grey and drizzly day at St Johns. The Jets lined up without Todd, Matt or HarryB, and it was an even start, before the momentum shifted as the Jets came close twice, Jack heading against the bar. E&B pushed forward too, but a robust run by Ben R led to Ben W grabbing a lead, 1-0. Nutty started making runs down the left, and even shooting from distance (!) before a second goal; Jack was fed by George, and struck home into the far left corner. A quick turnaround, and a balanced passage of play, as E&B tried to get back into the game, but the third goal was for the Jets. Cam's free kick hit the bar, and Ben R scrambled the ball home. But E&B did edge back as a skewed clearance was calmly finished, and things almost got worse as Toby scuffed a back pass, but redeemed himself with a wonderful save. Angus, Ben R and George dug in in front of Scott and Cam, and took the strain, ably assisted by Sam... Will and Harry put in rotated shifts, Taig showed strength on the ball, and the Jets regained control. The contest was ended when Ben W ran onto a long clearance to make it 4-1, and then George again set Jack up for a 5th, to close out a hard game. The score didnt ultimately reflect E&B's contribution to it, but the Jets advance to play Aylesford at home in the quarter finals. Amazingly it looks like 7 of the 8 quarter finalists will come from the U13 Central division. After a wet and rainy week Sunday afternoon was bathed in sunshine. With the Rec waterlogged the Jets relocated to their second home at the 3G. Ben W came on and injected pace, and came close himself.....Scott and Harry kept their concentration well, as did Toby behind them. Finally, 5 minutes before half time Taig stooped to nod home his first goal for the Jets, and a earn a deserved lead. The pace of the game was frenetic....aside from the lack of goals it was an excellent game. The turning point in some ways was the last minute of the half. First the excellent Aylesford keeper dived bravely to deny Ben W in a one on one, and then he had to do so again when Jack was through. This second save left him injured; no question of a foul, just two brave lads both making contact with the same ball and a heavy collision. The keeper didn't reappear for the second half which forced an Aylesford reorganisation. Jets' through balls now put much more pressure on the defence....finally Jack thumped home the goal his performance deserved, and it opened the doors.....in quick succession Will and Ben R both poked home their first goals of the season, and then each added a second. (London buses) .It's easier to play with a big lead but the football flowed as well as it has at any time this season. The only blemish was a late Aylesford goal, borne of defensive overconfidence, but they deserved it for their effort and contribution to a good game. A very good day. Excellent referee, very sporting opponents, outstanding food and drink served from Pam's gazebo...how it should be. And still top of the league.....just! The Jets travelled to Tonbridge, playing on familiar ground in what turned out to be a memorable cup fixture. The outcome was not guaranteed until the final whistle, as the Jets could not put away spirited opponents. The final woodwork count was 5, and that excludes a list of outstanding saves made by the Boca's keeper. In the first half Will came close on several occasions, as did Ben. When the shots were good so too were the saves; some chances went begging as well, and it almost came back to haunt, when a weak tackle set up Boca's only real attack of the half which led to Toby turning a header onto the crossbar, then doing the same to the follow up, and then managing to catch the rebound whilst lying on his back on the line. Toby didnt have a shot to save second half, as the Jets pressed harder and harder for a goal that wouldnt come. A Ben W volley was turned onto the underside of the bar, and Matt's rebound was treated the same way. Scott headed onto the post, several other chances skimmed across the six yard box, Nathan whistled one wide, and when at full stretch the keeper kept out Matt from Ben's cross it was feeling like there never would be a goal. 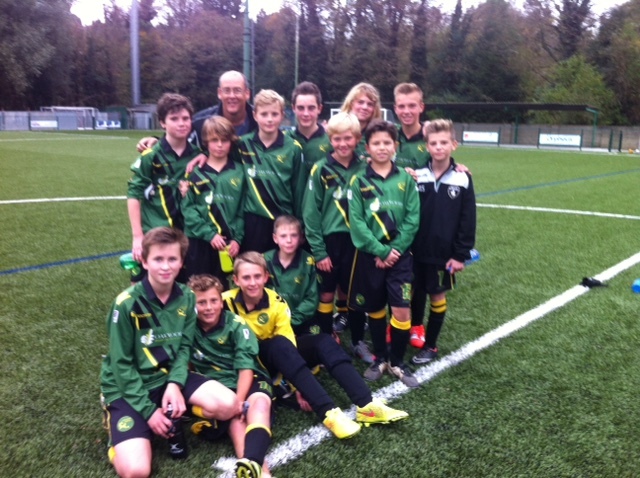 It was top versus second in the KYL u13 Central division today, as the Jets went to Whyteleafe (who played won the Tandridge league last year in Selsdon's colours). Half term holidays meant the Jets were missing George, Ben, Nathan and Taig, and giving a debut to Jack. The pre match talk was all about attitude and commitment, and the need to defend from the top of a 4-3-3. The early exchanges were even but gradually the Jets got in behind the Whyteleafe defence, and from a Ben R through ball Todd got there first and lifted the ball over the keeper. He got a finger to the lob, but not enough to stop the ball creeping over the line, 1-0. Todd almost added a second from close range, then Matthew smashed a shot against the post, before Whyteleafe turned the tide. A succession off free kicks around the Langton box gave cause for anxiety. From one Harry B made a fantastic flying header clearance from under the cross-bar to save a certain goal. Toby was looking on top form too. Whyteleafe kicked off, kept the ball purposefully, worked their way down the pitch and won a penalty. 'Seen 'em given' but Cam felt he had made a good challenge. No matter, 2-1 and the whole half left. Ten minutes later and Whyteleafe were level, after another free kick on the edge of the box was smashed home. The pre match talk had been about not giving free kicks away in dangerous areas....this one probably wasn't a free kick, but plenty were....it was a matter of time before one was going to be conceded. And that was supposed to be that. Exhausted Jets had given up the lead, and it would be a matter of time before the death blow was landed. Except no-one had told Toby. Several 'worldy' saves later and not only had he kept Whyteleafe out, but a sense that this might be one of those days was starting to grow. The tackling grew in passion; Cam and Harry were winning the aerial battle, but defending so deep meant an alarming amount of possession was being conceded just outside the box. Whyteleafe kept coming close but creeping offside at the wrong moment. And then a breakaway - Jack made inroads down the left, and pulled the ball back.....to Angus. Angus had started the day as right back so showing up on the left corner of the opposing penalty area wasn't really meant to be on the menu, but he took a touch and lifted a chip. At full stretch the keeper just kept the ball out, but he was down and the ball was on the line.....and Todd is pretty good from that range into an empty net, 3-2. If Whyteleafe had felt the world was against them before, this made it worse. If the Jets needed reason to fight and tackle and block, before, this was what they needed to keep going to the end. Scott kept protecting the defence, Will, Harry N and Woody were being frantically rotated, everyone else was just hanging on. It really wasnt very pretty, and there was no doubt who was doing all the passing, but sometimes the score dictates the game. Another break and Matt sent Todd clear through....it was a chance to end the game but he hit the keeper, who stood up well. Into injury time and one last Whyteleafe chance crept inches past the post. Game over. No-one would pretend it couldnt have gone the other way. Sometimes you need to take your chances, defend well, and have your goalkeeper play a blinder. And when the keeper plays a blinder and everyone else gives a 100% occasionally good things happen. Huge credit to players, coaches, and supporters of both teams for playing the game in the right spirit. Whyteleafe were magnaminous in defeat. They won't lose many. A sunny day, a heavy pitch, and a new formation. With Nathan and Angus absent the Jets tried a different formation, asking boys to play in some unfamiliar roles. They did so with great success. Despite playing uphill and into the wind the boys were their most fluent in some time. Todd was in behind the defence with support in numbers, the midfield was aggressive, and the defence was firm. An early 2-0 lead was richly deserved, on the back of two good finishes from the no.9, but then some dreamy marking let Folkestone back in the game. Taig added some bite as an unexpected full back, Hary jinked along the left wing, and Will and Cam each came close to adding a goal before half time. Most of the second half was spent trying to put the game away, with near misses and almosts, before George struck from long range. Matt hit the underside of the bar and was left to regret the lack of goal-line tehnology, then the keeper did brilliantly to deny Ben W. But the Jets conceded one free kick too many, defended too deep, and gave Folkestone reason to hope...3-2. As time ran down it all got increasingly desperate but Scott, George and Matt's work rate was outstanding, and Cam and Harry stood firm, supported by Sam. The final whistle came and it was a deserved win, perhaps a little closer than it needed to be, but a pleasing performance with everyone making a contribution. After four road trips the Jets came home to Langton Green. But in familiar surroundings they started out of sorts and it all went wrong from there. The first goal conceded was a penalty; not a kind decision, and Toby almost saved it. The second was from a free kick that was equally disappointing, and with a similarly disappointing outcome. With their two goal cushion Welling played with confidence whilst the Jets mis-fired. That might have been manageable with a down hill half to come but tame defence gifted a third goal on the stroke of half time. It wasn't an easy half time conversation. Out-passed and out-fought the Jets had to look at themselves and find something. The second half was better, but still not fluent. Matthew scored a fine free kick, only for Welling to reply with one of their own. It didn't happen today, sometimes it doesn't. It is important to learn from disappointments rather than repeat them. This isn't a league where anything less than 100% is going to be enough. The Jets travelled to Canterbury for their first ever Kent Cup fixture....that wasn't made easier by the closure of the M2. And, for the second week in a row, they had to overcome player absences as well. Missing Ben R, Scott, Nathan and Cam they welcomed Harry N back into the team, and when Todd became available at the last minute they were able to field 11 players. Luxury! Three games in four the Jets have made a slow start and conceded first. Today they had a couple of early 'moments' to raise the heartbeat, but then settled. George and Matthew found their range with the through balls and Todd and Ben W began a steady stream of raids on goal. Each teed the other up for a tap in, then Matt crossed a ball home, and added another after a great through ball from Ben. The half time lead was enough to allow the boys to work on their passing and this bore fruit in the second half. The simplicity of the goals was testament to the penetration. Ben and Todd continued to feed each other close range chances, and add to their tallies, whilst another set piece goal was scored as Harry volleyed home a corner. Woody ought to have scored, Harry N deserved to score, and George did score, only to see his goal disallowed. The Jets went to Rusthall on a gorgeous sunny morning. They were missing Nathan and nursing an injured Scott, and slightly concerned at the fitness of several others who had missed school this week, and played the day before as well. Not the best preparation. Rusthall took full advantage, playing down a significant slope. Twice in the first 15 minutes old friend Anton broke clear and finished neatly. The Jets were two down and on the ropes. Time to dig in. Cameron led the fight back, taking charge at the back, and driving forward; Ben W was aggressive and positive. A corner on the right was cleared back to Matt, whose left foot delivery picked out the big target...Cameron powered his header into the corner, a great goal. Between there and half time the Jets played some of their most fluent football of the season so far. One excellent free kick aside, the football was played up the hill, and in Rusthall's half. The half time talk was not about the score but about the performance; there was no shortage of belief. In the second half the Jets didn't concede a shot, but Rusthall were resilient. Chances came and went, and patience was required. Finally Matt drilled a low corner that Ben W squared at the back post for Todd to finish from a yard out. Game on. A good game, well refereed, no quarter asked, none given. On the balance of chances the Jets would have preferred a win, but coming back from two down early there was good to be taken from the day. On the road again, another big pitch, and the chance to apply lessons from last week. However the Jets conspired to miss the final pass, sky the shot, or give up possession, sufficiently often that West Wickham deserved the lead they took 20 minutes into the game. It did wake the Jets up to an extent, as Matthew immediately equalised with a left foot screamer from distance. Nathan came on and made an immediate impact down the left, with two great chances to lead at half time being scrambled away, but the half-time talk was more about what needed improving on than on what was going well. It was a case of 'here we go again' when WW retook the lead, heading home a corner. It was shaping up to be a crisis, but Todd ran away to equalise quickly again. The football started to click, with Nathan and Ben R making inroads down the left, and Will, Ben W and George doing the same on the right. A free kick was won in a dangerous area and Matt hit it hard, right foot this time, 3-2. Relief turned to comfort soon after as Harry's header hit the bar, and everyone chased the rebound, Scott was there first, 4-2. Comfort turned to luxury as Todd won a penalty, and Matt gratefully rounded off his hat-trick, after which the excellent Nathan took the ball all the way to the six yard box, and unselfishly set Todd up. There was still time for another defensive lapse, so it wasn't a perfect performance, but there are some building blocks in place now. Three games, 9 points, and the goals shared around. The first road trip of the season, to Chatham who opened last week with a draw. A sunny day but surprisingly windy, and before a ball was kicked it was setting up to be a proverbial game of two halves. The Jets lost the toss and were obliged to go downhill and downwind without knowing what a par score might be at half time. A big pitch, long grass, strong wind, all made the pitch play very big. Chatham pressed for a couple of corners that might have been dangerous but were well defended, and then the Jets had two of their own. And two goals, both from Cameron, up from the back, both highly competent finishes, after good deliveries from Matt and George. This was a great early cushion to have, and it became quickly better when Ben W used the wind to score from distance. On a scrappy day this was a big lead. The football wasn’t great, and clearly the second half would need determined defending, so boys were rotated to allow them the energy for what was to come. Chatham knew they were still in the game if they could score quickly. The Jets sat deep, leaving Todd largely unsupported, but that was the job that needed doing. Getting in behind the defence was key, but Toby was quick off his line and whilst the ball was usually in the Jet half there were no meaningful shots on goal. Harry, Cam, Angus and Sam all stood firm, protected by great tenacity from George, Scott, and their usually more attack-minded team-mates. With 5 minutes left Chatham got a shot in the air from distance, and the wind did the rest, 3-1. It had the potential to set up a tense finish, but as Chatham pressed forward they left themselves exposed to the breakaway, and Todd collected, threaded through and Ben W killed the game, 4-1. The first weekend of a new September, and a new challenge. For some boys this was season number 8 at Langton Green, for others it was game number 1. For all it was a debut in the Kent Youth League, watched by the league’s CEO, Ken Brooke, who had travelled down to watch the newest participants in the league. Since the end of last season the Jets have progressed both on and off the pitch. New goals, food and drink on the sidelines (thank you Pam), and some new arrivals to the squad, never mind a step up to 11 a side. Were they ready? Their opponents (KFU from Dartford) arrived impeccably dressed in smart shirts and ties, and with an impressive number of fans ready to enjoy the game in perfect weather. The stage was set. KFU set off with a fluency confirming they had enjoyed a fine pre-season. The Jets were on the back foot, and holding on. A great strike from distance gave Toby no chance and a goal down early it was looking uncomfortable. Gradually the team hauled their way back, and established some possession in the KFU half. A Matthew free kick was half-cleared and Todd finished decisively through a crowd, 1-1. Soon after it was almost two as Harry B’s header from Matt’s inswinging corner only missed by inches. The pattern of the game had changed now; Scott pressed up on the KFU playmaker and this seemed to cut the flow, and whilst the Jet attacks were a bit frenetic, the pressure was beginning to tell. The lead came from a quality second from Todd, lifting the ball over the goalkeeper from outside the box, and by 25 minutes he had his first hat-trick of the season; the smallest player in the box was also the one who most wanted the header, 3-1. A familiar scorer, but scoring in some unfamiliar ways, suggesting development of a rounder game. At this point 3-1 up the hill was a very good place to be. However a free kick conceded in front of goal, a deflected shot, and a half-time score of 3-2 meant the game was by no means over. The half time review recognised the battling effort being put in by George, Ben R and Scott – the boys knew they weren’t clicking, but that sheer effort might see them home. Committed to using the squad there had been a lot of rotation, particularly for Will, Woody, Ben R and Nathan, but consensus was that it was more beneficial on a hot day than disruptive to rhythm. The second half picked up where the first had finished, with rousing tackling, not least from Cam and Harry. There was also a bit more of a pattern going forward as Matthew kept getting down the right and delivering dangerously. This led to the 4th goal, albeit from a set piece. Instead of floating the ball in from wide he went hard at the ball; Scott was first to react and caught the ball first time on the volley; screamer. With breathing room the Jets looked to put the game away, and only outstanding saves from the KFU keeper denied Todd, and then Ben W. But then another dart down the left from Will, a delivery that could only be parried to Ben W, and it was 5-2. Finally some comfort. This allowed a little more rotation, resting some, and giving opportunities to others, which needs to be a feature of the campaign this season. KFU threw the kitchen sink at a comeback, but Angus showed wisdom in his cover play and Toby looked comfortable. Final whistle, big smiles. Job done. KFU were hugely sporting opponents (and fans), and hopefully every referee is as good. It wasn’t the prettiest performance, but that will come. Perfect day.